(Bloomberg) — JPMorgan Chase & Co (NYSE:JPM). suddenly finds itself caught in the middle of the struggle for power in Venezuela. The dilemma surrounds the bank’s bond indexes, long the industry standard for gauging emerging-market performance. 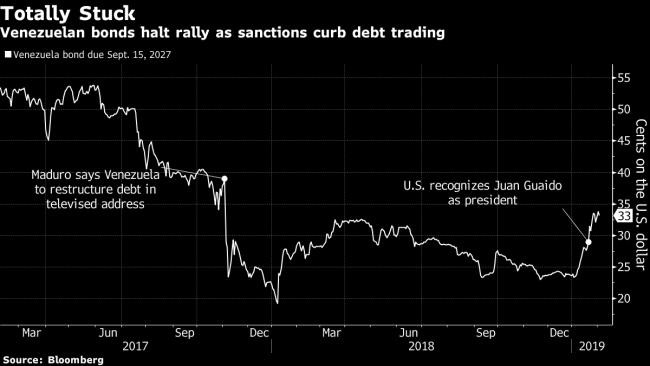 After the U.S. slapped sweeping sanctions on Nicolas Maduro’s regime last week, trading in the nation’s defaulted debt grounded to a halt — a development that typically would prompt JPMorgan to yank the notes from its indexes. But bondholders as well as some Venezuelan politicians aligned with Juan Guaido, the U.S.-backed lawmaker trying to oust Maduro, are now actively lobbying to get JPMorgan to keep the debt in the index. For creditors, the rationale is straight-forward: Removing Venezuela from the index would pressure them to dump the securities at rock-bottom prices. For those in Guaido’s camp, it’s a bit more complicated. Their concern is that by forcing mutual funds, ETFs and other traditional investors to unload the debt, it will wind up in the hands of hedge funds that are more aggressive and potentially even litigious in bond restructurings. 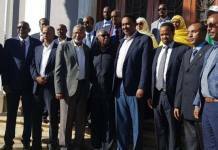 That in turn will hurt their efforts to impose a sizable haircut on creditors — a key part of their plan to stabilize the crisis-torn country if they manage to take power. A group of Venezuelan lawmakers has been holding calls with officials at JPMorgan. They fear a messy debt restructuring akin to the one seen in Argentina after its 2001 default, which resulted in years of legal wrangling that left the country locked out of international capital markets for more than a decade. Already, some London-based hedge funds have shown an increased interest in Venezuelan debt on the possibility that it may soon become cheap. Earlier this week, a contingent of creditors including Greylock Capital and Goldman Sachs Group Inc (NYSE:GS). met with Treasury Department officials to voice concerns that some of them would be required to sell at steep discounts if Venezuela was bounced from the index, according to three people familiar with the matter. The country’s benchmark notes due in 2027 last traded at about 33 cents on the dollar. JPMorgan declined to comment, but on Monday confirmed that it was reviewing Venezuela’s inclusion in its indexes. Goldman Sachs and Greylock declined to comment. The Treasury Department didn’t respond to requests for comment. While Venezuelan bonds for many years made up at least 5 percent of JPMorgan’s benchmark indexes, that weighting has declined to less than 2 percent more recently. Still, it was enough to compel the majority of emerging-market mutual funds to have some exposure to the debt, most of which fell into default over the past year and a half as Venezuela’s economy was battered by hyperinflation, declining oil production and widespread shortages. But after last week’s measures by the Treasury Department all but halted trading in the bonds, JPMorgan is now reviewing whether the low liquidity disqualifies Venezuela from the indexes. Its guidelines don’t specify a time period for potential removal. Last April, the Russian aluminum producer Rusal was ejected from JPMorgan’s indexes three weeks after U.S. sanctions. Yet even Hausmann himself recognizes times are different today.